Quatre-épices is a French "four spice" blend. Like so many spice blends, everyone that makes it has a different blend. Often it has five or six spices. Generally the mix always includes pepper, nutmeg, cloves and either ginger or cinnamon. Some people add allspice in lieu of cinnamon. Some recipes call for both black and white pepper. However you blend it, it gives a rich and complex flavor to baked goods. It is also use frequently in terrines and pates. I hate fussy recipes. 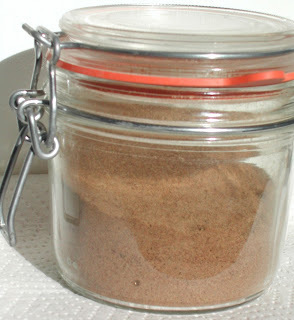 If you find one of those tedious recipes that calls for 1/2 teaspoon cinnamon, 1/4 teaspoon nutmeg and a 1/4 teaspoon ground cloves, just add one teaspoon of quatre-épices. It will give the recipe a great kick. I make it in large batches, so basically it is and equal parts ground white pepper, nutmeg, and cinnamon and half a part of ground cloves. The ground cloves can be overpowering, so you don't need as much. Try it the next time a recipe calls for plain cinnamon. I think you will enjoy it.